Maybe it was the weather or maybe it's overdue for a full overhaul - but my little Bernina was in a funk today. 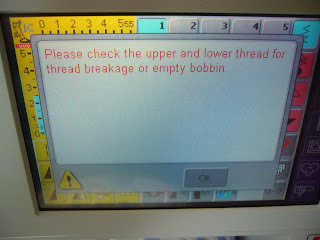 I kept getting "please check the upper and lower thread for thread breakage or empty bobbin" warning. I checked, I cleaned, and it kept popping up - check, clean, mild expletives, but no solution. It is sewing just fine despite the warning - soon, I promise, I will take you in for a good cleaning. 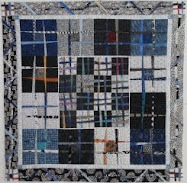 Finally finished up Cheryl's quilt today - as soon as I have news on her book you'll be the first to know. Favorite quote from the Olympics last night (I'm addicted to the Olympics) in reference to one of the ice dancer's attire - "here's the top now let's go over it" - truer words were never spoken. That quote is a keeper for my Layers Quilting group. 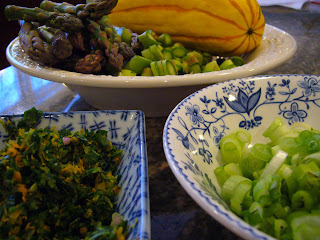 Here are the stars of tonight's dinner - our veggies include a side of delicata squash, and our main course headliners featuring asparagus, spring onions, and a parsley tarragon gremolata. 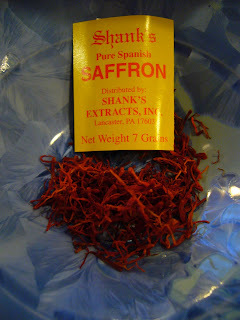 The flavor secret - saffron, direct from Lancaster, PA. Saffron is the stamen of the crocus flower, and this saffron from Shank's receives rave reviews over the imported stuff - give it a try. The menu for tonight is Sauteed Chicken Cutlets with Asparagus, Spring Onions and Parsley - Tarragon Gremolata - you can prepare according to the recipe, but I suggest cutting the olive oil and butter measurements in half; and, I omitted the cream completely - it didn't need it. 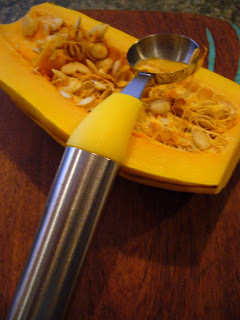 Delicata squash is delicious as a side dish - no need to peel - simply half, remove seeds, and slice into half inch slices - toss with 1 teaspoon of olive oil, salt and pepper, and roast at 375 degrees for about 25 minutes. 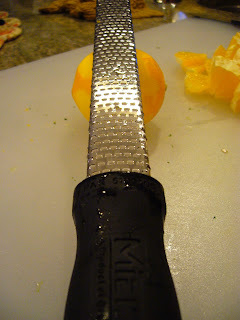 Here are two more tools I love - 1. my microplane zester - good for zesting citrus, grating hard cheeses and nutmeg; and 2. the "scooper outer" - sorry I don't know the name of this - it is intended to de-seed a cucumber but you'll find many uses of it in the kitchen - it makes quick work of de-seeding the delicata squash. After dinner we had a Brown Butter Pecan Biscotti with our espresso - yes, I am keeping it light this week, but I'm all about including a little treat now and again. 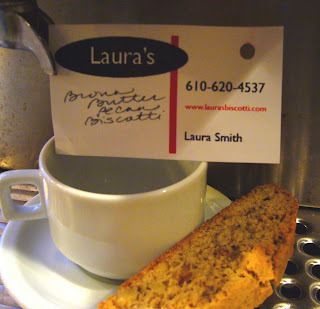 These biscotti are made by my good friend Laura Smith - visit her website, www.laurasbiscotti.com to find out where you can buy them - they are delicious!